The Rolling Stones were scheduled to appear on an episode of ‘The Ed Sullivan Show’ in January of 1967. Before going on, Sullivan instructed Mick Jagger to change the title of their single ‘Let’s Spend The Night Together’. The band complied, although Jagger spent the performance rolling his eyes at the camera every time he sang the changed line “let’s spend some time together.” The Stones only appeared in one other episode of the Sullivan show in 1969; rumour has it that the band was asked by producers to wear matching suits for a cleaner look, but were allowed back into their own clothes after they showed up for the taping in matching rental Nazi uniforms. Sussex police, tipped off by the ‘News Of The World'(who were tipped off by Keith Richards’ chauffeur), raided a band party at Keith Richards’ legendary Redlands estate in West Wittering. While no arrests were made at the time, Jagger, Richards, and a guest were charged with drugs offences. Known as the Redland Raid, this moment marks the beginning of the band’s long history with drug charges and legal troubles. Brian Jones, guitarist and one of the founding members of the Stones, had been with the band during their heaviest drug years; in 1967, Jones’ house was raided and he was arrested and charged with cannabis possession, which resulted in his refusal of a US visa while the band was attempting to tour. These charges, paired with the news that Jones’ former girlfriend Anita Pallenberg was leaving him to start a relationship with Richards, were too much for Jones to handle. He announced his split from the band, and the other members left for the tour without him. A few weeks later, Jones was found dead in his swimming pool in East Sussex. Held in Northern California, the festival was headlined and organized by the Stones and featured other big acts, including Jefferson Airplane and Crosby, Stills and Nash. The infamous Hells Angels were hired by the Stone to provide security for the event. Despite the impressive list of acts, the festival is remembered for its considerable violence and property damage; there were four deaths in the crowd that day. Three deaths were accidental, with two hit-and-runs and one drowning. The fourth death, however, was the homicide of eighteen-year-old Meredith Hunter. After a particularly rowdy Stones number, Hunter caused commotion by pulling a revolver from his jacket. A member of the Hells Angels stabbed Hunter in the side, forcing him to drop the gun. Hunter’s autopsy confirmed he was high on methamphetamine when he died. Hells Angels member was arrested and tried for murder in the summer of 1971, but was acquitted after a jury viewed concert footage showing Hunter brandishing the revolver; they concluded that he had acted in self-defence and dropped the charges. In February of 1977, Richards was detained by customs on his way to meet the band in Toronto for being in possession of a burnt spoon and hash residue. Three days later, the Canadian Police showed up with an arrest warrant for Richards’ partner Anita Pallenberg; inside, they discovered 22 grams of heroin in Richards’ room. Richards was charged with importing narcotics into Canada, an offence that carried a minimum seven-year sentence. prosecutor later proved that Richards had obtained the drugs after landing, and he received a suspended sentence and was ordered to play two free concerts for the CNIB in Oshawa. 1979: Russian roulette or suicide? Seventeen-year-old Scott Cantrell, a groundskeeper at the house that Richards and Pallenberg shared in New York, was found in Richards’ bed with a bullet in his head. Cantrell was rumoured to have been involved in a sexual relationship with Pallenberg at the time, although nothing was ever officially proven. Richards was in Paris recording with the Stones at the time of the shooting, but their son was at the house when the shot was fired. Pallenberg was initially arrested for murder after rumours that Pallenberg and Cantrell had been playing a game of Russian roulette began to circulate. The police investigation later stated that Pallenberg was not in the room or on the same floor of the house at the time the shot was fired, and the death was officially ruled as a suicide. 1989: How old are you again? Bill Wyman, the longtime bassist for the Stones from 1962-1992, became the subject of considerable media attention when he announced his marriage to 18 year-old Mandy Smith. Wyman was 55 at the time. Even more concerning was the fact that the couple had begun their “courtship” when he was 50 and she was 13. The marriage ended shortly after Wyman left the Stones in 1992. After touring through multiple countries in 2006, the Stones took a short scheduled break in New Zealand before proceeding to Europe. During this break, Keith Richards fell out of a tree in Fiji and was hospitalized for cranial surgery, leading to a six-week delay in the tour. The news that the Rolling Stones were going on tour for their 50th anniversary was initially great news to fans across the world. That is, until fans caught a peek at the prices. Standards tickets for their two-night stint at London’s O2 Arena will cost between ￡90 and ￡375; prices for their two performances in New Jersey in the US are almost twice as much. Many fans have already expressed their horror at the prices and disappointment in the band; many have announced their boycott of the tour. 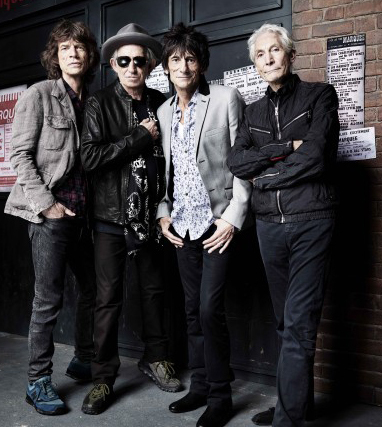 It has been rumoured that the Stones will get paid ￡15 million ($25 million) for just these four gigs; that they play for two hours and split the profit equally, each member will be making close to half a million pounds per hour. The Rolling Stones play London O2 Arena on November 25th and 29th. The documentary film ‘Crossfire Hurricane’ will go on general release in November. ‹ WILDEST QUIFFS IN ROCK ‘N’ ROLL!